The Vietnam War defined a generation. It was the inspiration behind scores of songs, sparked dozens of riots, and came to be known as the most controversial war in American history. Associated with the Vietnam War was the anti-war movement, and the rise of the hippy generation, Daniel Ellsberg and The Pentagon Papers. (Read Cathy's review of Most Dangerous: Daniel Ellsberg and the Secret History of the Vietnam War Steve Sheinkin). For a time the only books on the origin of the Vietnam War were found in the adult department. 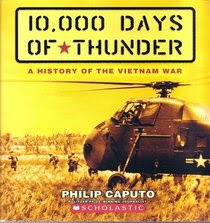 But all of that changed when, in 2005, Philip Caputo, a Vietnam veteran and Pulitzer Prize winning journalist, wrote a long-overdue history of the Vietnam war; the first of its kind for young readers. 10,000 Days of Thunder explained the origins of the war which had roots in Communism, colonialism and the Cold War. The Vietnam War has three dubious distinctions: It was the longest and the most unpopular war in American history and the only war America ever lost. Whether as advisors to the South Vietnamese Army or as combat troops directly engaged in fighting the Viet Cong and the North Vietnamese Army, U.S. soldiers served in Vietnam from 1959-1974. The book’s design is inviting; it includes hundreds of photographs, key campaign and battlefield maps, anecdotes from soldiers and civilians, and, most important, a compelling narrative. Back matter includes a glossary, bibliography, a list of Vietnam related websites (that still work), index, and on the end pages a timeline. Informational books on Vietnam: Most Dangerous by Steve Sheinkin, Last Airlift: a Vietnamese Orphan’s Rescue from War by Marsha Forchuk Skrypuch. Fiction titles: Fallen Angels by Walter Dean Myers, Vietnam series by Chris Lynch, Year of the Jungle by Suzanne Collins, Cracker! : the best dog in Vietnam and A Million Shades of Gray, both by Cynthia Kadohata. For those students who are drawn to books about the Vietnam War, suggest the following movies: The Most Dangerous Man in American: Daniel Ellsberg and the Pentagon Papers and The Fog of War : lessons from the life of Robert S. McNamara.